After testing and rolling out two Android 8 Oreo beta builds to few owners, Oneplus has officially started rolling out the stable version of the android 8 Oreo update to Oneplus 5 users. The new update which is the OxygenOS 5.0 is based on Android 8.0 Oreo is currently being rolled out to all users across the world. According to Oneplus, the new update features a better optimized Launcher for Shelf, as well as a new option that will allow users to upload their photos through Shot. The camera app has also received a new UI design and optimization for better photo quality and new beauty effect for portrait mode. A new “Place” tab for viewing photos on a map has been added too, along with new history and alarm calendar features for the Calculator and Clock, respectively. 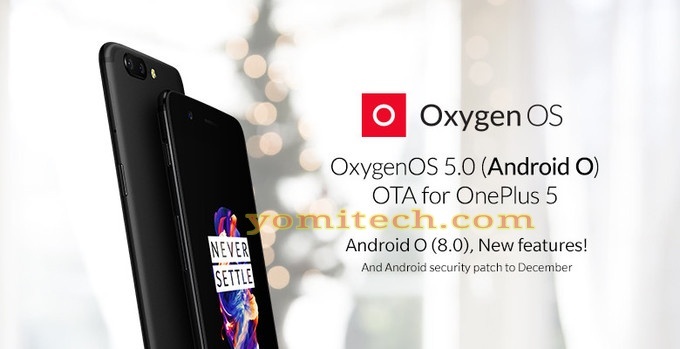 Below are some of the newly added features and improvements of the android 8.0 Oreo based OxygenOS 5.0 for Oneplus 5. Note that the update is being rolled out as an OTA and might take a few days before you receive it depending on your region. Make sure you have a strong WiFi network and your phone is charged or plugged into the power outlet before you go ahead with the update.